Eastnor Castle is available as a luxury corporate venue for Teambuilding and Activity Days, Meetings and Conferences, Private Dining and Parties. Our sumptuous bedrooms can be used by small groups wishing to include dinner and overnight accommodation in their programme. We pride ourselves on the highest standards of comfort, impeccable service and attention to detail. Our professional team will plan and organise your event and your guests will enjoy a warm and relaxed atmosphere in this truly exceptional family home. The castle is situated in the Malvern Hills and is located in the heart of a 5,000 acre estate, yet is only ten minutes from the national motorway network. The hilly terrain and breathtaking scenery also make the Eastnor Estate an ideal location for team building and activity days. 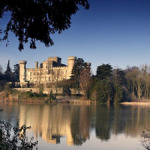 You will find tranquillity, splendour and complete exclusivity at Eastnor Castle and, whatever you are planning, we will enjoy the challenge of exceeding your expectations.